When you are looking for a chemist, for many today this is service attached to their doctor’s surgery, or prescriptions can be fulfilled on line. But what of the past? I thought I would take a look at how many chemists there have been in the past, what services they offer and of course anything specific with which they have been involved. 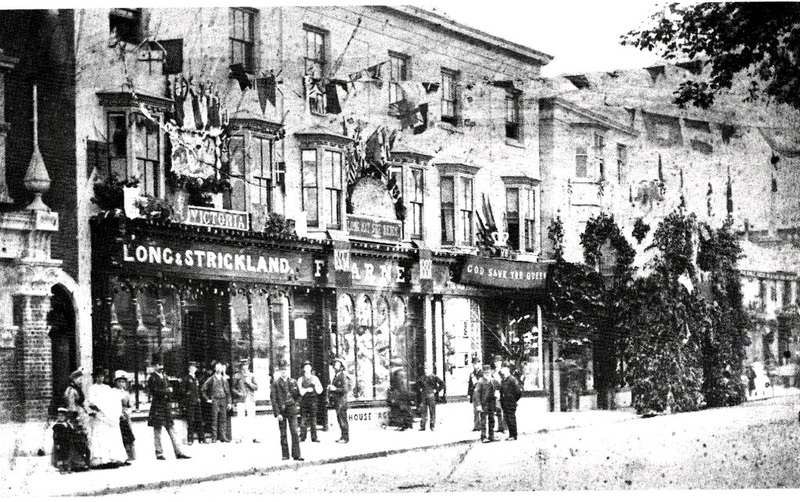 One of the earliest was Long and Strickland, which was situated in the High Street at No 21 and was established as far back as 1853. One of their adverts in 1916 lists a number of items that were available from the store to cure colds and flu at £1/11/2 (6p today) or what about chamomile, quinine and rhubarb pills to cure dyspepsia and biliousness selling for £1/11/2 per box? I can remember this chemist being in the High Street, but some advertisements from the 1930s showed they had branches in Felpham, Rose Green and Aldwick. There was even an advertisement in 1944 advising that dispensing records from Rose Green and Craigweil were retained with them and they advised that they were retaining their regular opening hours ‘during blackout months’. The High Street site is today occupied by Subway. During the 1890s the seaside resort of Bognor continued to develop. Visitors were coming into the town from London and other places in the south of England to enjoy the seaside. However, one shopkeeper, James Hughes, a chemist in West Street, was very concerned that the large number of children who visited the area could not obtain even a drink of water. James’s shop in West Street looked down the length of The Steyne to the seafront promenade, a site he believed would be ideal for a drinking fountain. 60th anniversary on the throne. James was very keen on his suggestion and started a fund to raise the necessary cash, and at the same time Bodie of Aberdeen selected a design. The fountain was to cost a staggering £111 although the local water company did agree to supply the water at half price. The site was confirmed to be at the end of the Steyne, against the edge of the promenade. On July 6, 1898, the new drinking fountain was eventually unveiled and was to be a permanent reminder of Queen Victoria’s Jubilee celebrations, for the residents and all the children who came to the seaside, as well as supplying the much needed drink of water. His shop was eventually taken over by CT Copper, as the Steyne Pharmacy, when he again doubled with photographic services. The site was eventually taken over by West Side merchants and today is retirement flats. In a 1916 Bognor Directory, there was a large advertisement for Shipman, Sudley Pharmacy who was eventually replaced by Radford Chemist Ltd, showing the address now as No 1 Albert Terrace, opposite our recent main post office. Clive Radford moved to Bognor Regis from London with his family, initially to work with Boots at the newly-opened London Road store in 1934 in London Road. He left Boots in 1951 to take over the Albert Terrace premises and remained there until he was 73 years of age. During the early days of Butlin’s in Bognor Regis, when it provided a full nursery service for guests, all the necessary provisions for the children was collected from Radford’s. Further along the High Street one of the notable photographers was Cleeves, which was situated on The Esplanade and in the High Street, where today we have the NatWest Bank. This chemist was very active with the photographic side of the business and would take a variety of pictures of the town and then produce his own ‘home-grown’ postcards. Within the Aldwick shops, there was Edwin Thorp, who advertised as an ‘analytical, pharmaceutical and photographic chemist’. He also advertised he had a ‘dark room for amateurs’, thus continuing the photographic theme. There was a church at the junction of London Road and the High Street which was very popular. However, in 1929, a number of approaches were made with regard to purchasing the site, as it was a prime location in the town as developments were taking place, and so the decision to sell was made, as the congregations were being disturbed ‘by the uproar of traffic’. It was eventually sold to Timothy Whites and Co for £17,000. A clause was inserted stating ‘that no building now erected or hereafter to be erected on the land or any part thereof shall at any time hereafter be used as premises licensed for the sale of alcoholic liquor other that medicated or medicinal wines’. That year there was a chemist at No 7 Water Tower, namely Edward J Davis. Today, this shop is still there and occupied by Dexter’s, which is one of the few small independent chemists still operating in our town. The Bognor Regis Kelly’s directory in that year listed 16 chemists in the area from Middleton across the area to Pagham. Some of these remain but many have closed, as the growth of the modern service of being attached to surgeries, supermarkets and being available on line, also being delivered direct to your home. It is evident today that many of the varied services offered by the older pharmacists are now not available. The photographic side of the early chemist are now superseded by photographic shops, or the digital age of working on line.